DEFT DECORATING: “What I love about this job is that I never know who will be on the other side of the door when I ring the bell. I’m honored that people let me come into their lives for a period of time.” Anne Battle, owner of Rooms For Improvement, enjoys helping clients create a new look for their surroundings. Is your pad sad? Are your digs drab? Now that spring is here, a new look may be in order for rooms that are a little tired, rugs worn from kids’ feet and pets’ paws, and furniture, if not frayed, perhaps forlorn. Not to worry, help is at hand! 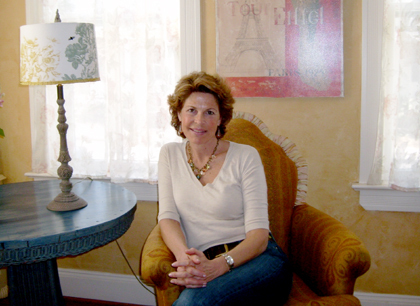 As owner of Rooms For Improvement, Anne Battle has been helping clients create a new look in their homes for the past four years. Even before, when she was owner, with Marcy Kahn and Shelley Roe, of Birds of A Feather, the gift and furniture shop in Kingston, she helped customers with furniture placement and color ideas. 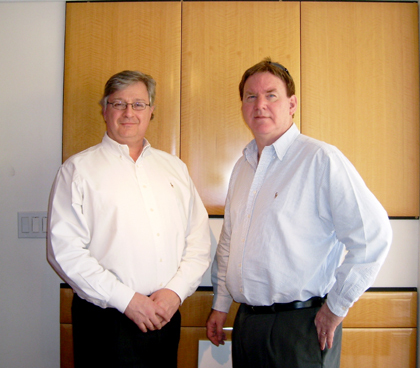 CUSTOM CABINETRY: “Our niche is that we design and sell premium custom cabinetry and integrate it within all the other aspects of the kitchen.” Bill Noval (left) and Bruce Timbie, owners of Spyglass Design, Inc., stand in front of Neff “Anigre” wood cabinet panels. Bill Noval and Bruce Timbie want you to have the kitchen of your dreams. The Hopewell natives opened Spyglass Design, Inc. at 31 West Broad Street in their home town in 1997, and demand for their elegant designs and custom cabinetry continues to grow.